There are many good reasons to rent a storage unit! Perhaps you move around a lot and need somewhere to store items you can’t bring with you. Maybe you’ve decided to go on an extended vacation. Or maybe you’ve just accumulated so many things your home no longer has enough space for it all! Rather than just renting a unit and assuming it will work out, look carefully at what you are planning to store. The size of unit and type of unit you rent will be dependant on what kinds of items you will be storing and how much space you need. Jiffy storage offers everything from home office storage to long or short term heated storage, to business storage and a whole lot more. If you are planning to store important documents, antiques or fine art, you will need a unit that is specifically climate controlled to keep these valuable items safe. If you are storing very valuable items, you may also opt for an individually-alarmed unit for greater security. These are just a few examples of objects that have special storage requirements. It’s important to know that not all items are created equal and different things require different types of storage! Everyone’s storage needs differ, so speak to a storage expert to determine what kind of unit is right for you. 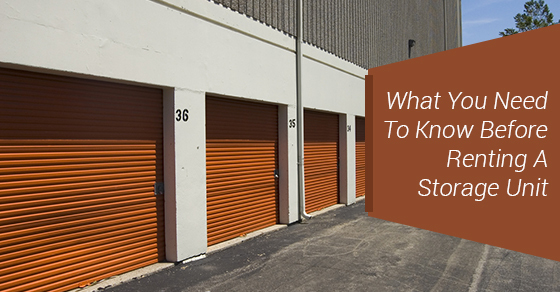 Two important things to research when considering a storage unit include location and price. Compare costs to find out which option is best for you. Location is important, because you always want to be able to reach your belongings should the need arise. By planning ahead and doing your research, you should be able to find a conveniently located and well-priced storage unit! You will need to find out how the items you store are covered under your homeowner’s insurance. No matter how stringently protected your storage unit is, you never know when items could be damaged. Make sure, especially if you’re storing valuable items, that everything is covered under your insurance, even if it’s stored off your property. The storage experts at Jiffy Self Storage can help you answer any further questions you may have! We offer storage solutions for nearly everything, from mini storage to an outdoor parking compound. Please contact us today with any storage questions!